If you’re anything like me (gluttonous, food-obsessed and perpetually peckish) then healthy light meals will only get you so far on cold January nights. But bigger meatier fare doesn’t have to be totally unhealthy. It makes you happier, and a healthy mind leads to a healthy body, right? Right?. With that in mind I spent a Sunday lovingly cooking this little beauty. And red meat aside it really isn’t particularly unhealthy. The motivation came after spotting a big ol’ hunk beef shin in Meat N16 (our local butcher), all gnarly and full of connective tissue. Just what you need for a bit of slow cooking magic. The beauty of long slow cooking like this is that while it takes time, it takes comparatively little effort. Sure there’s a bit of stirring and seasoning at the start. But then there’s just several hours of slow simmering on the hob while you kick back and relax. It’s this tremulous simmer that performs the magic. Nothing shows off the alchemy of cooking like a stew or braise. Cheap tough cuts of meat go in, unctuous meltingly tender nuggets of joy come out the other side. It’s the culinary equivalent of turning lead into gold. And in these cold depressing months, it’s food to warm and nourish the soul. It gets even better after a day or two in the fridge. So go on, treat yourself and bubble up a big batch. This is an endlessly customisable dish. You could use red wine instead of beer, mutton or lamb instead of beef (although you would want to change the stock to lamb, chicken or just water). Don’t like carrots or turnips? No worries, use leaks and parsnips instead. Why not add some pearl barley in at the start to make it even more filling. When I re-heated a second batch, i added brussels chopped in half. They were great. Coat the beef in some plain flour, dust off the excess and then brown in some butter or oil (or dripping/lard if you’re proper old school). Set aside. Then add a little more fat to the pan and fry the onions until they’re soft. Add the garlic and stir a couple of times. Then add the beef and stir some more. 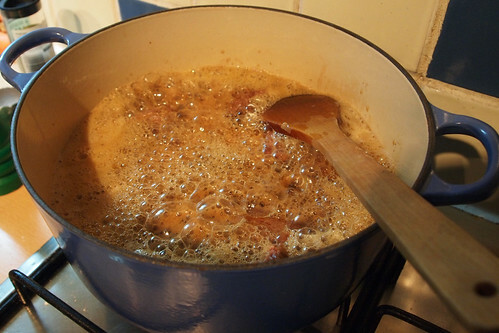 Pour in a little of the stock and stir and scrape the crusty bits off the bottom of the pan. Cook it at a gentle simmer for about two and a half hours (or longer of you need to). Add some more stock or water if it starts to look dry. An hour and a half before you want to eat chuck in the vegetables, roots and tubers. Let the stew bubble slowly away for another hour. Now taste the stew and season to your preference. I thought there was a slight bitter edge to the gravy and so added a teaspoon of black treacle and a teaspoon of caster sugar which did the trick. Cook for another 30 minutes. Serve with bread, US style biscuits (a bit like scones) or as it comes. It’s rich, meaty and warming. A winter delight. 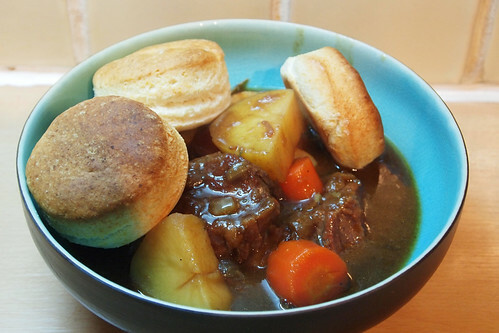 Nothing like a beef stew to fight away the winter blues! This bizarrely reminds me a little of slow-cooked Chinese beef brisket. And on that thought, I reckon your stew would be great on top of some broad rice noodles (ho fun) or some bouncy fresh noodles (saan mein – the ones served with wonntons). @Mr Noodles – funny you should say that, i was considering ditching the beer for pure stock, adding a little Shao Xing, a star anise or two, some ginger and dark soy. Maybe some chilli. That’s on the agenda for next time I have some gnarly old beef. Totally agree re the noodles, it would be great with soem udon too. 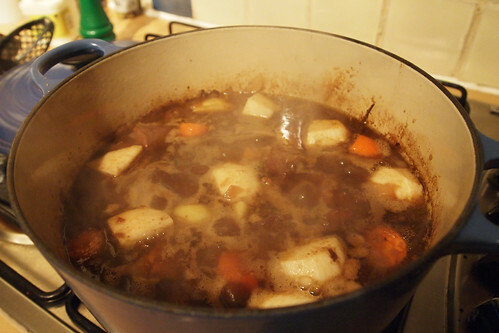 I love a bit of beef and stout – very hearty and warming, as you say. My next project is a beef and ale pie, with a cheap cut and some Dragon Stout in the slowcooker for about 8 hours, cooled, then cooked in a shortcrust pastry pie (not really into puff). Slowcooking and slowcookers are perfect for these cuts (I cook a lot of brisket too) that would be tough as bootleather if you tried to roast. ‘Low and slow, break it all down’ – that’s the mantra. This is the sort of thing that makes my mouth water with wont. I’m vegetarian. Beef stew is perfect for the weather now. All things roasted/ stewed really. Funny , your reply to Mr noodles, that’s exactly.how I stewed some venison necks about a month ago, down to the sx wine and Chinese braising spices! That looks delicious. I don’t really follow any food blogs but I seem to share exactly the same taste buds as you so I’m hooked! Keep posting! I’ve not brought anything from N16, is the meat as good as it looks ? @Alex – low and slow is definitely the right mantra, both for the season and for those lovely cheap cuts of meat. @Thursday – oh dear, I hope it won’t be your downfall These long slow cooking meat dishes are the hardest to replicated with veg, although you could do something with mushrooms, wine and beans maybe? @catty – there are some advantages to being in a cold climate! @Mzungu – heavenly indeed! So far I have had all good meat from N16, it’s about time there was a good butcher on Church St. They give you bones if you ask too, i had a load of lovely beef ones from them. Oh yes, and their wine is ace, one of the few places where the £10 bottles are consistently worth the price. 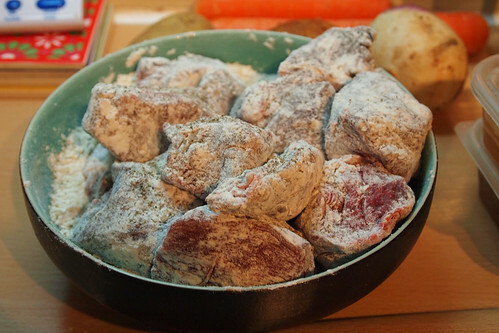 If anyone were to be my downfall, it would indeed be you with the likes of your beefy stew. Sometimes, I love the idea of tucking in to such-like but, when it comes to it, I just can’t bring myself although I have absolutely no problem with other people eating meat. Indeed, mushrooms, beans and wine are the nearest combination a vegetarian can get to a hearty stew. I love fish which is regularly eaten, faves being meaty monkfish or the oft-found on the continent truite rose which is gorgeously delicate.